Click to purchase the VENUS Deluxe Half-Drilled Pearls Kit. Oops, sold out! Check out our available items here. Try the bangle on your wrist for size. Then try slipping the pearls onto each end to see whether you are satisfied with the length of the bangle. If it's too big, you can snip off the edges with a pair of wire-cutter pliers. Purchase our pliers here. Before working with superglue, always have old newspapers on your table. Have the ends of the wires be parallel with your table or tilted downwards. By the laws of gravity, the superglue will fall/drip onto the table instead of your fingers. The old newspapers are there to catch any drips and spills. You may also dab off excess, drippy superglue onto the old newspapers before proceeding with the next step. Accidentally got superglue on your fingers? Dab them away with cotton soaked in oil or nailpolish remover until the superglue is fully dissolved! Wash your hands with soap and water immediately after. Dab the superglue onto one end of the wire, and insert the pearl. Repeat for the other end of the wire. 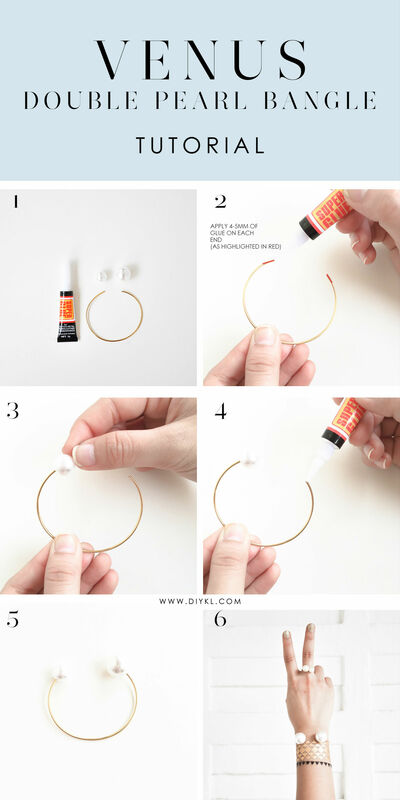 Once you have glued both pearls onto the wire, let it dry for at least 10 minutes! Have a chic armparty with your VENUS Double Pearl Bangle!